Margo Lanagan’s “The Goosle” combines Australian myth with horror in a gruesome sequel to Hansel and Gretel. Jeff VanderMeer has come to our rescue by getting every author under the sun to let us know what to drink with her or his latest offering, over on Omnivoracious. He found so many opinions that he had to split the idea in two, like they do with overlong fantasy novels! Go here and here. You'll be so up-to-the-minute when you've worked your way through this list. But oh, the headache you'll have. Starry Rift—you know you want it. 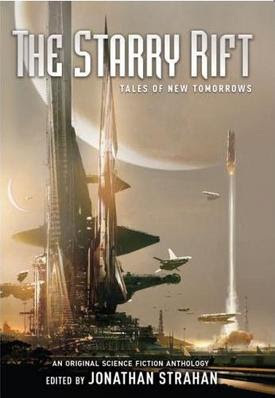 The Strahan-edited The Starry Rift: Tales of NudeNew Tomorrows actually came out yesterday, so now we can say, 'Yes, it's true! The future is nudenew! "The Star Surgeon's Apprentice" by Alastair Reynolds. I've read them all, and I tell you, there's not a dud in it. And there's a website, and everything. Although you've missed the free-copies competition. Now you will have to go out and buy. I was going to tell you about the books I've been reading lately, but I see I've already been so snarky tonight that it might be dangerous. This morning I was drafting the beginning of my rant: 'Sturgeon's law says that 99% of the sturgeon you catch are not going to have any caviar in them...' No, I really ought not to go on. Maybe Wednesday will be better. Sometimes you can only shake your head and swear under your breath. This is one of those times. another weekend passed, and now we're in a week again. This morning as I was heading up to the train station I reminded myself how much I got written on the train commute back in 2000: most of Black Juice, reviewed afresh but vair-vair lukewarmly over here. A train passed a train. Does anyone know, is it okay to make stuff up in a haiku? If I'm not entirely sure they were delphiniums, am I allowed to put them in? I slept in, then spent 6 hours workshopping, averaging a page an hour and eating and laughing a lot in between. Looxury! Six more hours tomorrow. Hmm, I could get used to this. Current reading: Paul Park, The Tourmaline.